Can a book be enticing, dramatic and electrifying without profanity or graphic scenes? ABSOLUTELY! YOU’VE FOUND IT! 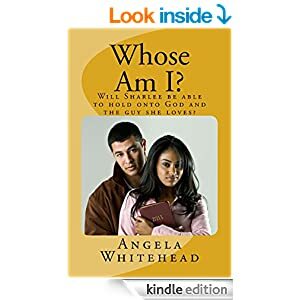 Whose Am I?, is available on eBook for $2.99 and is also available in paper copy. Interested? Read on . . .
What’s a girl to do when a five foot eight, hazel eyed import from LA shows up at school one day? What else, but fall head over heels in love! That’s exactly what happens when Lukas strolls into Sharlee’s high school in the suburbs of Atlanta. All the girls want him, but to Sharlee’s surprise he asks her to the Homecoming Dance. But Lukas will have to get the approval of Sharlee’s Bible toting grandma before he takes Momma Johnson’s baby girl anywhere. Somehow he survives the hand wringing interrogation, but not before Momma Johnson makes it perfectly clear that Sharlee is a Christian girl and better stay that way. Easier said than done! Sharlee finds herself in some pretty sticky situations that put her faith and will power to the test. Will calling on Jesus, a praying best friend and a Bible App get her through prom night and a weekend rendezvous? Only time will tell.